The latest addition to our range of devices is our ankle brace range. Each device has a fully custom foot plate. We have developed a adjustment options that allow the patient to adjust the device as needed to increase either the lateral or medial support. Our newly designed rocker brace is totally unique and has been developed over the last two years in cooperation with trauma victims who have helped with valuable feedback. These can be made from a full ankle cast with the forefoot corrected or from a foam impression cast. The foam impression cast requires more clinical measurements. 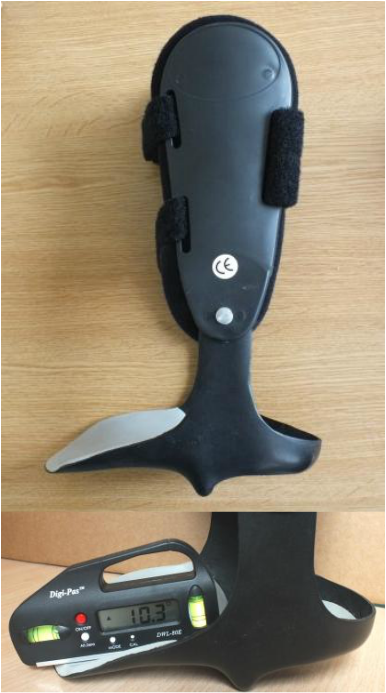 This device has a medial strap which pulls the medial arch upward along the line of the tibialis anterior. This allows the patient to adjust the level of support. This devices is primarily used for patients with severe foot dysfunction as seen in cases such as ruptured tibialis posterior and traumatic flat foot. The lateral sling is designed to give adjustable support under the lateral border of the foot for patients who have suffered with lateral instability. The velcro strap is easily tightened to increase support when needed or to reduce support as the ankle recovers. 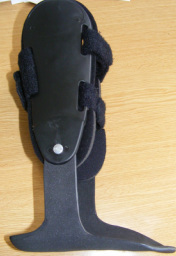 As the name sugguests this brace has to straps which allows the patient to adjust the level of pull in either direction. The double cradle affect then completly stabilizes the foot in the required position. The cradle straps can be elasticated in order to assist with dorsiflexion of the ankle joint. This is our most recent inovation the ankle rocker brace. As can be seen the rocker when triggered can easily produce 10 degrees of dorsiflexion for patients who have suffered severe ankle injury or trauma. The base plate articulates inside the shoe and at heel strike absorbs shock through the side walls of the device and holds the ankle at in a relatively dorsiflexed position(approx 90 deg) to that normally taken up by the foot at this stage in the gait cycle . 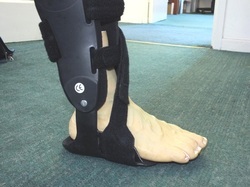 This allows a momentary build up of energy in the device which is released when the device triggers and rocks the patient forward as the heel is projected upwards. The patient in the video link below had severe trauma to his left foot as a result of an explosion. He has since completed a marathon having been expected to at best be able to walk with a limp and not to be able to run.